If you are working on your personal statement for The Common Application or other college applications, the first step is to start to think about yourself. For some students, reflecting on and analyzing their backgrounds can be a snap. They enjoy that type of introspective, heady thinking. For others, it can feel intimidating and baffling. Okay, so this is a bit of hyperbole on my part. All students have plenty to write about for their college application essays. However, from what I’ve seen working with college-bound students for the last decade, many of our most talented, driven and intelligent teenagers are living such parallel, over-achieving lives that they struggle to find an effective essay topic. These are the same kids, many targeting Ivy League educations, who will need bull’s-eye essays to have even a shot of getting in. Every year, I write a post for all you students who are ready to start your college application essay. All you need is to find that one magic topic idea. There are many ways to brainstorm ideas for college application essay topics. 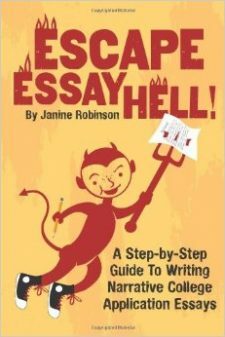 This time, I’m going for the essay jugular and offering a brainstorm guide to start your college application essay by honing in on your best problems. Let Lynda Barry Help You Find and Tell Your Best Stories! If you’re starting to brainstorm that perfect topic to craft your dreaded college application essay, I have a new writing technique you might find helpful. I’m big on tapping mundane topics to inspire essays. That means writing about everyday or ordinary experiences as opposed to those that try to impress or wow readers (aka college admissions folks). Mundane topic example: My obsession with karaoke. Trying-to-impress topic example: The time I played the star role in the school musical. Which would you rather read about?